A couple of hundred officials, workers, and looky-loos braved the wind and cold rains and jammed the platforms of BART’s new Warm Springs/South Fremont station for this morning’s opening ceremony. Regular service begins tomorrow. “It is an engineering marvel,” said BART director Thomas Blalock, who represents the area, during a speech. He also boasted about the station’s eco-friendly features, such as solar panels. “And you can see bike lanes throughout the system,” he said. As seen in the photos below, there are indeed kermit-striped bike lanes and electronic bike lockers, which Streetsblog tried out–they work! That said, it’s unclear where anyone would bike to or from the station, since there’s not much in sight except open, empty land. The SF Chronicle broke down what’s currently around the station, such as the Tesla plant, about two miles away. And Streetsblog wrote a bit about the details of the new extension in a post after BART announced the opening date. But to review, this is BART’s 46th station, and it took 5.4 miles of new track to get there from Fremont station. That said, many officials were concerned about the disposition of the rest of the project, which is to extend BART to San Jose, given the current politics in Washington. For now though, the Silicon Valley Berryessa Extension project is still on track, with two new stations expected to open in 2017. Did you attend the opening? Will you ride the extension this weekend? Leave your impressions below. First, some more photos. Unclear why I would bike from this station? Let me give you my perspective! Currently my choices for getting to work (in Sunnyvale) from home (Oakland) are 1: a 2-hour-long bus ride, and 2: Capitol Corridor to Santa Clara / Great America (~50 minutes) followed by a 5-mile bike ride. With this new station I can opt for a 35-minute BART ride and a 13-mile bike ride, at less than half the price ($4.60 vs. $10), and with *way* more flexibility (BART every 15 minutes all day long, Amtrak has only 2 sensible runs and the last leaves Oakland at 8:50 AM), and probably much more reliable service. Especially in Sunny weather I will gladly spend the time for the extra 7 miles. When they open Milpitas that will get me 4 miles back. I moved a mile from this station so I could get to SF in a one hour peak-time train commute rather than a 1.5 to 2 hour car trip. I used to be an avid biker, but am no longer able, otherwise I would do that for sure. Plenty of places to charge my electric vehicle here. Since they are projecting 40,000 jobs will be created in the immediate vicinity of the station in the next couple years, car-bound Fremont suburbanites better hope that all those workers ride BART and bikes to their jobs. …so I guess they should remove the bike infrastructure, if no one’s​ going to use it? Refreshing, to see, Warm Springs, opens its station. This story reminds me how in 1967 we moved to west Berkeley were i attended Berkeley High School, i grew up in west Berkeley (at the time Berkeley made sure to underground BART, through the city limits of town). This accomplished two things, 1st because they did not wish to lower property values because one of the town leaders Mr. Sweeney, an African American did not want to further divide his city, and he was adamant in his beliefs. 2nd after the project was completed the city created a linear park way that included an east west bicycle pedestrian pathway. Ive lived most of my life on the wrong sides of the tracks and i know how it feels to live in a town, where it feels like you are a “stranger in a strange land”. Went down there this morning. Solar panels on a parking lot is some high-test greenwashing. Interesting that Berkeley made that decision. Didn’t know that. Did Berkeley have to pay the extra cost of giving it a luxury that no other Bay Area city got? I’d like to think so. If social engineering considerations add dollars to a project then that cost should fall solely upon the voters and taxpayers of that city. Well, it was 50 years ago when BART was apparently “state of the art”. Don’t here that phrase said about BART much any more. Well, I suspect a lot of city voters would support an overground transportation route that would help separate them from the higher crime areas even if it didn’t also mean lower taxes. Worked for Palo Alto, SF and Oakland. While part of why Marin rejected BART was because they didn’t want to make it easy for criminals to hop over there on BART for some easy pickings. But then Berkeley has more Prop 13 parcel taxes than any other city in the State. Affluent, liberal and hopelessly self-absorbed. Marin didn’t reject BART, they were forced out. After San Mateo left the district it was clear that the tax base of Marin was too low to pay for a costly Golden Gate crossing without the additional tax base of more populous San Mateo county, so Marin had to go. But sure, keep believing that every transportation decision is made based on fear of crime if it fits in with your warped worldview. I said it was a factor not the deciding or only reason. There was a widespread expression of concern at the time that crime might increase with ease of access, which is hardly a controversial view. I just used the infrastructure this morning for my commute. saw at least a few others who rode their bikes. You said “Marin rejected BART”. They didn’t. The three other counties decided to drop the deadweight of low population/high cost to serve Marin county. I’m sure cranks in Marin were grumbling about criminals coming over on BART, but that’s not why BART didn’t make it to Marin. Wrong. I said that the crime factor was an issue and it clearly was, based on the records. Was it the only factor? I never said it was. Was it an issue? Absolutely. several thoughts. solar driven car chargers make sense to me. 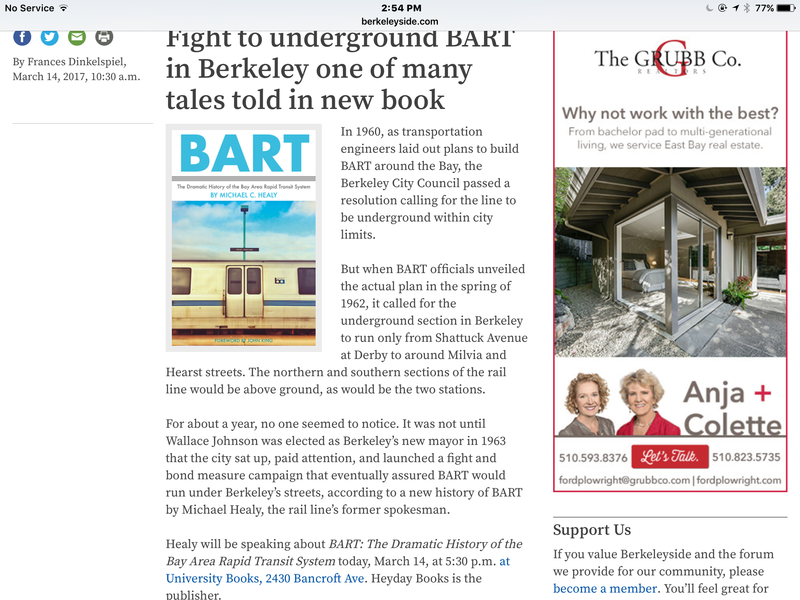 As to Berkeley insisting on a subway, WAY SMARTER imho. Too bad Oakland didn’t do the same at least from 19th north. The far smarter route would have stayed under B’way w/ the Macarthur stop at the Kaiser Hospital which was there already, then either stay under B’way or move to Telegraph ,stop at Ashby adjacent Alta Bates, then to Bancroft for direct access to Cal. . As you can see, all of this is keyed to major employment/academic destinations. All of that said, glad we have what we do, sad BART elected to build such an oversized and expensive station where a clone of the Bayfair version would have sufficed at much lower cost. Nothing new there just mega-millions up in smoke to no benefit. About Marin, supposed histories of the decisions contradict each other. Too bad. ebikes on bart and metro work great. Bikes to BART. Great idea, I’m glad to see they have the infrastructure in place. Build it and they will bike. To the author (Roger Rudick): you shouldn’t expect to be “in sight” of origins and destinations of bike trips. Most bike trips are between 1/2 and 3 miles in length, so the Os and Ds for those trips include businesses in the Warm Springs district, and homes to the north and east of the station, which appear to be connected by a decent network of bike lanes. You’re correct that all you can see from the station is a massive parking lot and some bare fields from which future residents will be able to walk to BART.